Although I’m usually a Royal Caribbean cruiser, I’m always up for a cruise on a new ship, no matter what cruise line! 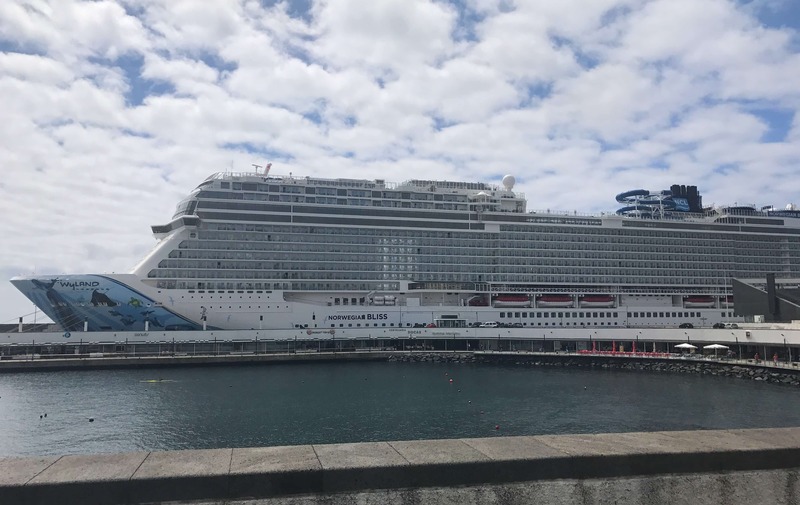 I had been planning to take the inaugural transatlantic cruise of Norwegian Bliss, from Southampton to New York, for over a year. I’m usually a last-minute cruiser, so this was a much-anticipated trip! I wanted to take this journey on the Bliss for a few reasons. I’m a sucker for “inaugural” anything – I like to be first!. I’d been wanting to do another transatlantic cruise since my TA on the Allure of the Seas a few years ago. 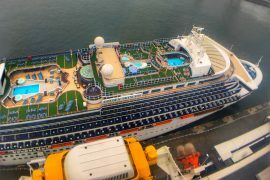 Plus, I’d sailed on the Bliss’s sister ship, Norwegian Escape, and had loved some of the features that were repeated when they built the Bliss, such as the Waterfront area and the District Brew House. Our sailing was a 12-night one with only two port days, in Ponta Delgada, Azores, and Halifax, Nova Scotia. If you’re doing the math at home, that’s right – we had a total of nine sea days! The itinerary was a great one if you love sea days, and they were broken up really nicely, with three days, four days, and two days between our ports. I definitely missed a few things about having a full-sized room, such as a mini-fridge and a regular bathroom and shower. 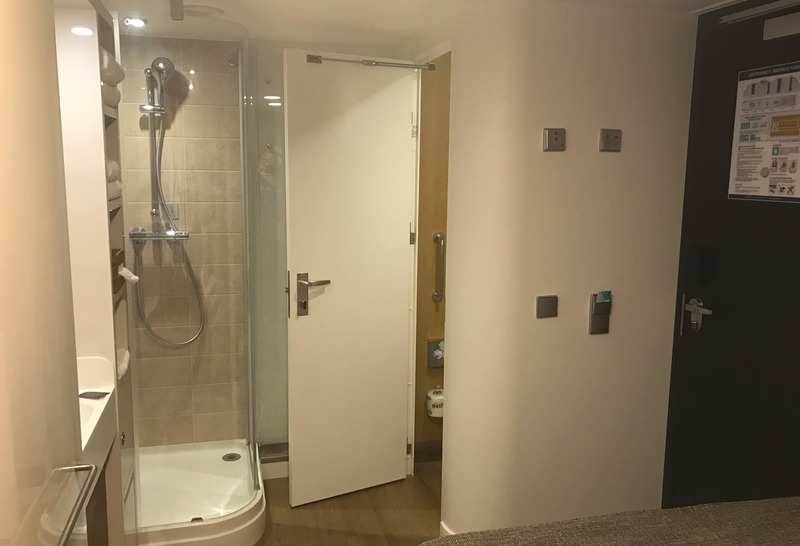 The shower in the studio cabins is basically in the room, and the toilet is enclosed in a room so small I could barely shut the door while I was in it! Overall, though, I would recommend the studio cabins for solo travelers, but I would caution against them for larger people – they might not be as comfortable. The studio cabins are enclosed in their own section and have their own dedicated lounge area. You actually can’t get into the studios’ hallway, or the lounge, unless you’re staying in one of those rooms. The lounge was handy as a flex space (although I spent a surprising amount of time hanging out in my room). It had a lovely espresso/cappuccino machine, which I made extensive use of. Perhaps it’s because I have a low bar for cruise ship entertainment – no offence to anyone. I’ve just been on a LOT of cruises – but I was absolutely blown away by the entertainment on my Bliss cruise. The Broadway production on board was Jersey Boys, which I had never actually seen before. It was well-staged and the talent was excellent. The in-house production “Havana!” was a little bit of a disappointment. The staging and sets were fantastic, but the story was a bit lacking and the songs somewhat repetitive. The real star of the entertainment lineup, was the fantastic country music played by Camille Rae and her band.The Q itself was a neat venue – built to resemble a Texas/Nashville dance hall. It served as a speciality barbeque restaurant for dinners and turned into a honky-tonk at night. The band played a great mix of old and new country and as it turned out they were also lovely people. I joined up with a group of “superfans” and we got to know the band members by talking with them after the show several nights. Camille is only on the Bliss until June, so you’d better hurry if you want to see the show. (You can also find her music on iTunes, which I highly recommend). The food on Bliss was at the higher end of my cruise dining experience. I went to two of the for-fee speciality restaurants, Cagney’s (steakhouse) and the Jimmy Buffett franchise Margaritaville. I was satisfied with both experiences, although I was a little unfamiliar with Cagney’s a la carte pricing, as I’m mostly used to paying a flat fee for speciality dining. 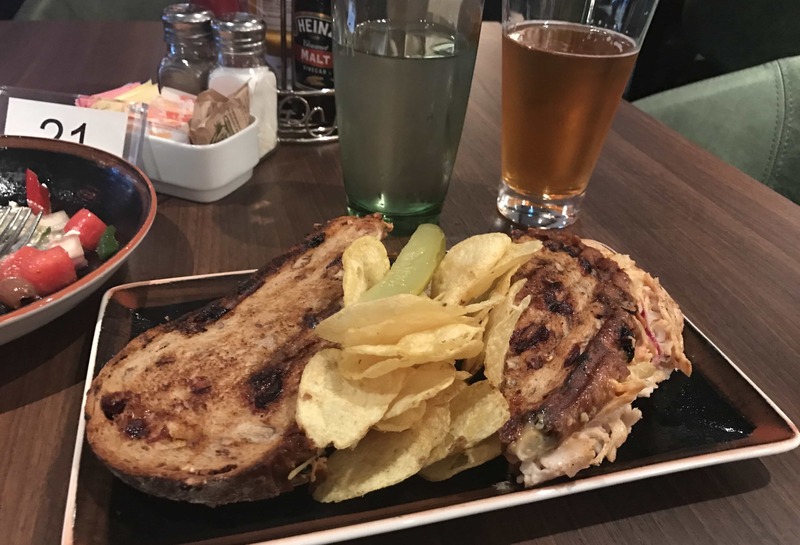 As a solo traveler, I found Norwegian’s emphasis on “freestyle” dining to be pretty great. I was a very frequent patron at The Local (frequent NCL cruisers will recognize this as O’Sheehan’s). This is a sit-down restaurant with a limited menu, which was a great place to pop in for a quick breakfast, lunch, or dinner. It’s located in a central area on the ship, so it was a great place to dine by yourself as there’s no end of entertainment to be had in people watching. I went to the dining room a handful of times and was overall pleased with both the food and the service. I liked that NCL’s freestyle concept. 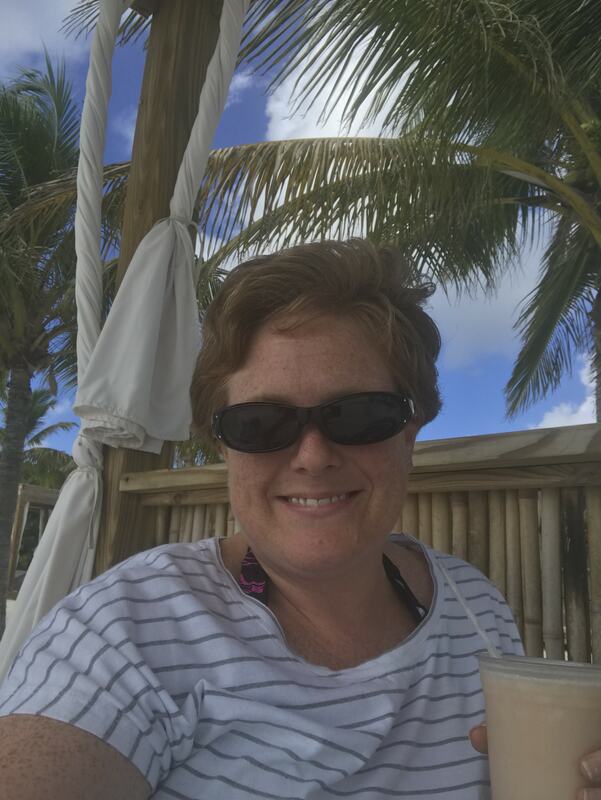 You show up at one of several dining rooms and are seated much like a regular restaurant – allowed a lot of flexibility, such as when I met up with some new cruise friends along the way. I decided to join them for dinner for a few nights. One of the things I liked most about the Bliss – and one of the reasons I’ll definitely do another cruise on the ship – was the Observation Lounge on the forward of deck 15. This giant room, at the very front of the ship, has towering two-story windows and a ton of comfortable seating options, from small tables to couches to loungers. 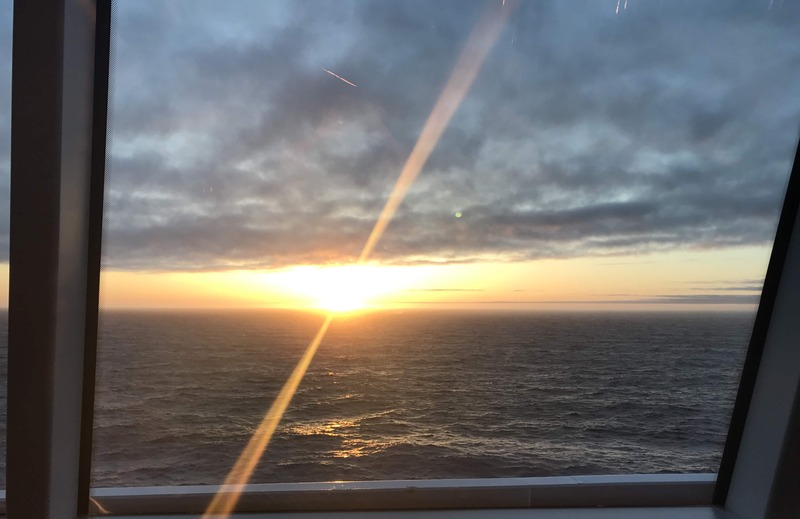 It was an amazing place to watch sunsets as we were heading west most of the cruise! To make it even better, the Observation Lounge serves a light continental breakfast and some savory bites and desserts at lunchtime. As someone traveling in a small inside room, it was nice to have this outside space to go to during our many sea days. I even started using it as a spot to catch up with other cruisers I’d met during the trip. Bliss is a big ship, but the layout is very friendly to walking around. Many of the dining spots and bars are clustered around an interior corridor on decks 6 and 7. Deck 8 has a great inside-outside concept where bars open out to a deck-facing area known as the Waterfront. 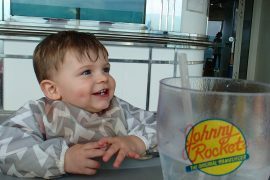 I especially liked hanging out on the outside areas of the Waterfront during our rare nice days at sea. I’d bring out a beer from the craft beer bar and sit and read my book. Because it was located on a lower deck, the Waterfront was also a great place to sit for our sail aways, because it was less windy than the upper decks. Somewhat unintentionally, I found myself in a cabin that was conveniently located to just about everything. Beers at the District Brew House, breakfasts and dinners at The Local. Dancing to country music in the evenings at the Q. Bliss isn’t quite as big as the Royal Caribbean mega-ships. So you don’t find yourself walking for days like I felt like I did on the Harmony of the Seas. But there’s something to be said for picking a cabin that’s convenient to one of the two banks of elevators. As I mentioned, I felt that this ship was ideally suited for traveling by myself. The range of dining options, at just about every hour of the day, really stands out as a big plus of this cruise. I have to admit that Norwegian’s “freestyle” concept of dining is more and more appealing to me these days. I also really appreciate the effort that NCL put into curating a great selection of craft beer at the District Brew House. As much as I love Royal Caribbean, the selection of beers on their ships is really pathetic. 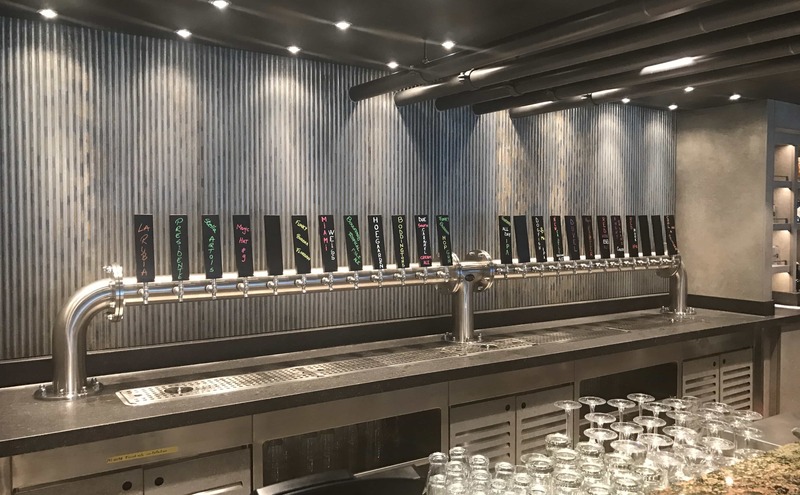 Even operating on a limited supply, the Bliss was able to offer several dozen options of excellent beer, both on draft and in bottles. They even picked up six kegs of local beer when we stopped in Halifax! This great option really made for a great cruise experience. Especially because I chose an unlimited beverage package as a perk when I booked! 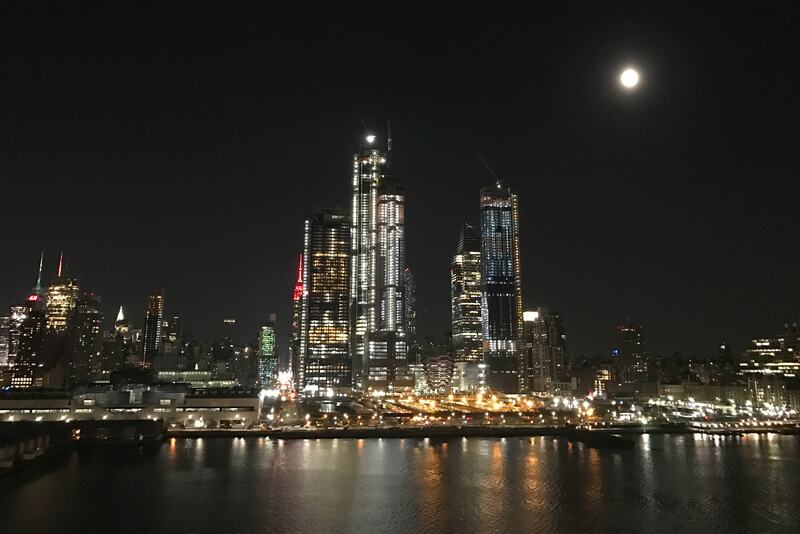 The perfect ending to my cruise on Norwegian Bliss was our sail into New York City, where we docked at the Manhattan Cruise Terminal. Because of the size of our ship, we had to come in around 1 am. This was the only time that tides would be low enough for us to clear the Verranzano bridge. There were tons of people on deck and the atmosphere was festive as we sailed under the bridge. We went past the Statue of Liberty and into the bright lights of the big city. They played New York-themed music – from Frank Sinatra to Beyonce – and it was a little cheesy, sure, but it was also great fun. Our sail into New York was fantastic, but there was a downside: Getting off the ship and getting to the airport was a bit of a nightmare. It makes sense, I guess, that when you disembark a trip in the middle of Manhattan, it would be kind of busy down there. But long story short, I managed to skip a ridiculously long taxi queue by using Uber, which I would highly recommend if you’re sailing into this cruise port. To be honest, there weren’t a whole lot of things I didn’t like about the Bliss! The trend of increasing the pay-to-play element of cruising is in full effect here. You pay extra both for food in the speciality restaurants and activities such as go-karts and laser tag. But as I always say about speciality dining, if you don’t want to pay for it, just don’t do it! So I wouldn’t really consider this a downside so much as something you might want to keep in mind when you’re budgeting for your cruise. Would I go again? Heck yes! 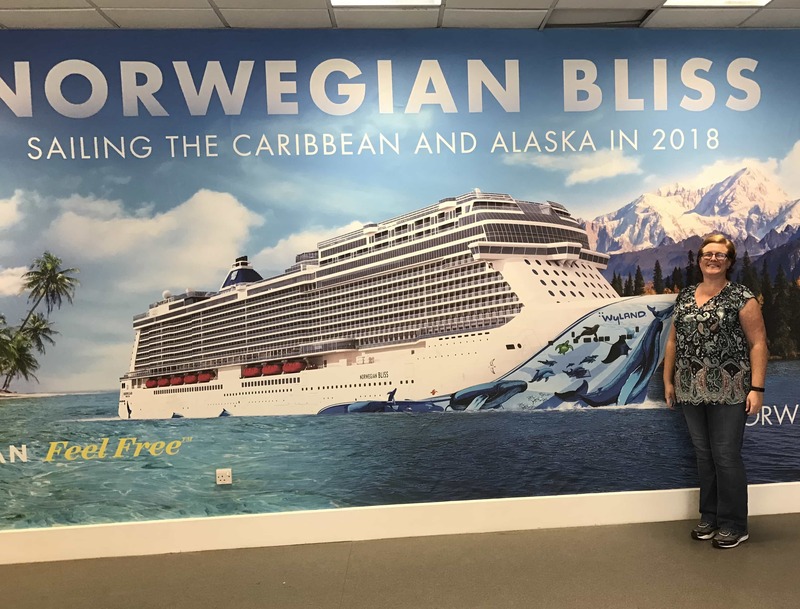 Bliss is going to be sailing on Alaskan itineraries in the summer (the ship is built specifically for Alaska) and Caribbean ones in the winter. I’m already targeting summer 2019 for my next trip on the Bliss. She also recently became the largest ship to pass through the Panama Canal on her way from the East Coast of the US to the West Coast. I’d love to do this itinerary on her as well. With lots of options and things to do, Bliss is a perfect ship for a long cruise – it really became my home away from home. Even in my tiny room! Thanks so much for this one! Bliss looks INCREDIBLE. It was really cool to see inside your solo cabin so thanks for sharing that one. I would definitely consider cruising solo, the prices really put me off though! 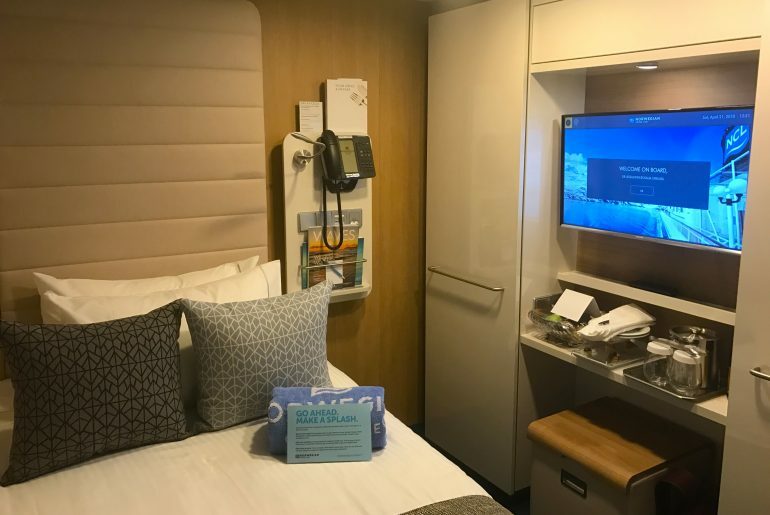 I’m glad NCL do have these solo cabins although they are still more expensive than bringing a friend. It’s so lovely to see a review where you have (almost) nothing bad to say. I love your positivity. 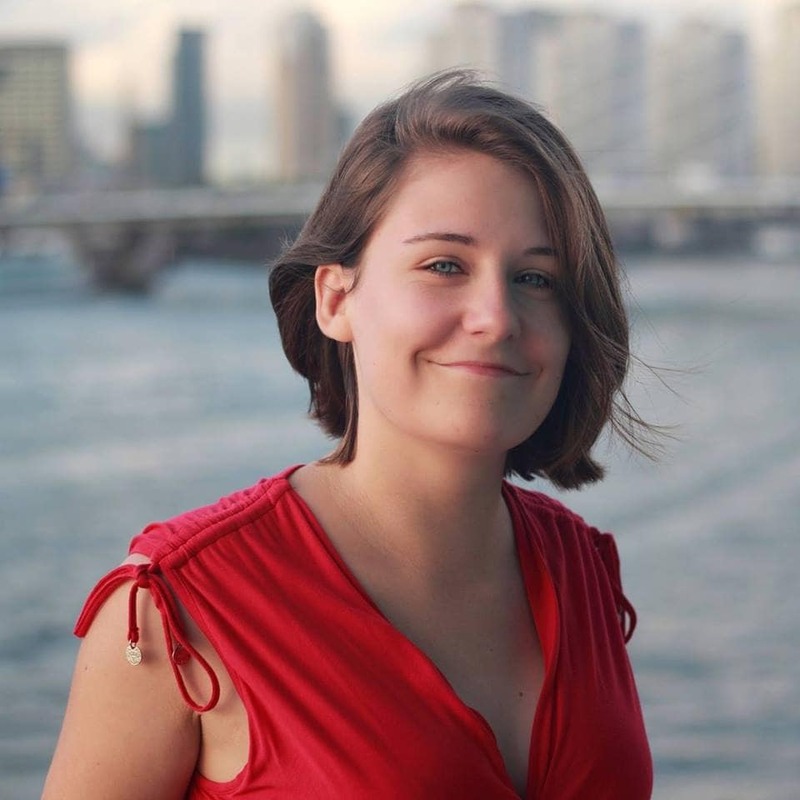 Jessalynn Strauss, aka The Nerdy Traveler, is a university professor and travel blogger from the USA. She loves cruising and will talk about it to anyone who will listen! She is also a travel agent so if you need any help booking a cruise, check her out here! Are you still reading this thinking, I recognise that face? Maybe you recognise Jessalynn from our money-saving collab video! 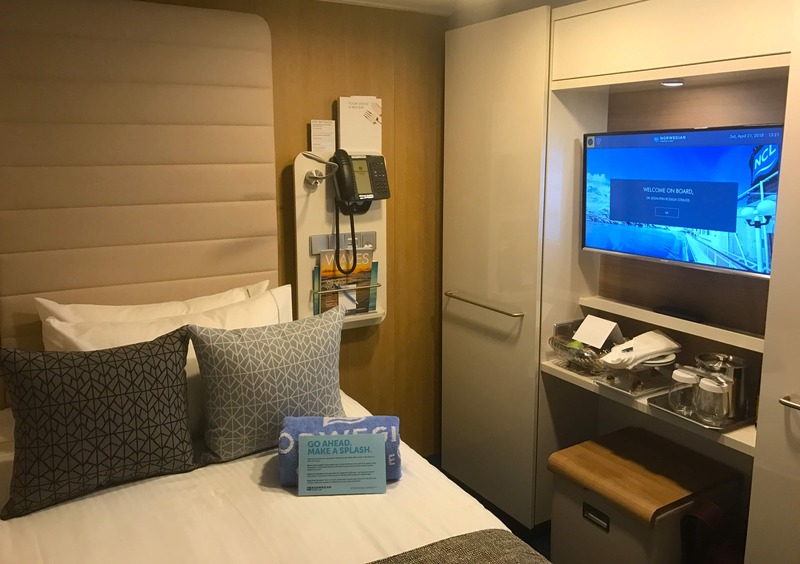 Jessalyn has also written a Harmony of the Seas review for us which is definitely worth checking out and a review of a virtual balcony cabin. We have loads more NCL content on the site. Make sure you check that out here if you are considering your first NCL cruise! Another cruise line that are good for solo cruisers are P&O. P&O even have solo balcony cabins! I recently took my first P&O cruise onboard Britannia which was amazing. 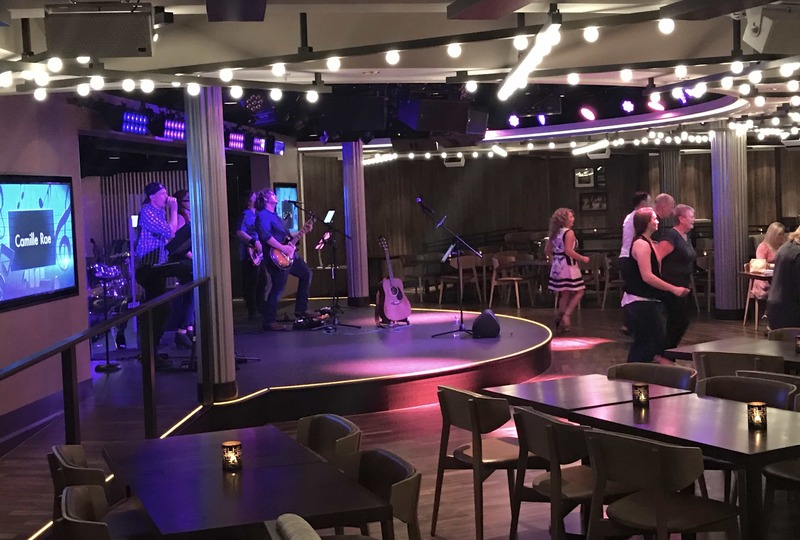 If you are considering a cruise on Britannia make sure you check out the 8 free activies that you must do onboard: P&O Britannia – 8 free ‘must do’ activities.